My last make was the 1589a top with the peep hole back. Even though I have since altered the straps slightly, I really like the fit and style of it. 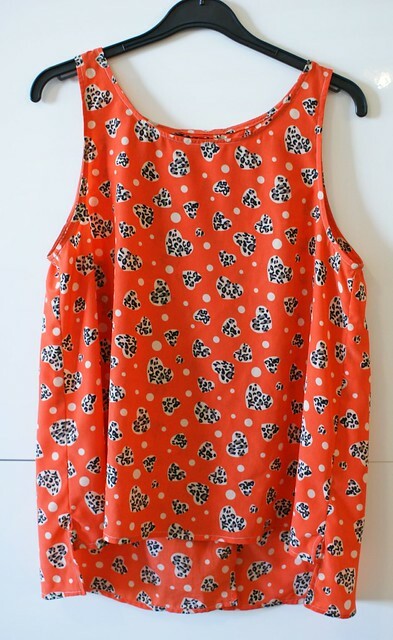 I’m after a few tops that are light and not too long, allowing me to wear them with jeans, skirts or shorts. As the fit was nice and the top itself was relatively easy to make, I decided on giving view B a shot last week. 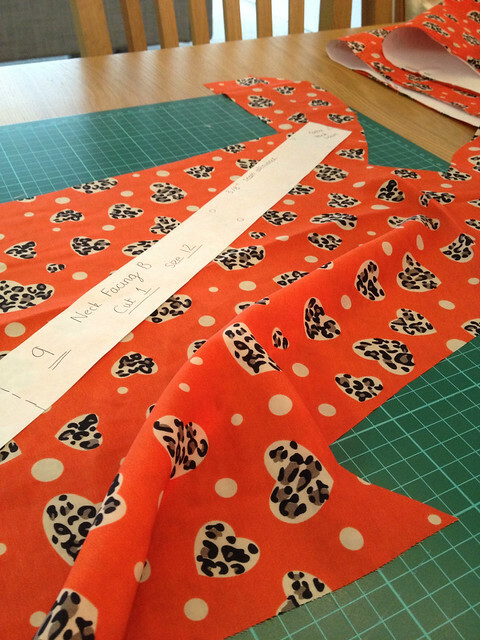 The pattern is simple; one piece for the front, two for the back and the facings. I decided to use a fabric that had been in my stash for a while. As always, I’m terrible with naming fabrics…this one was light, silky and I’m sure it contains polyester! The fabric is very me and as soon as I started the construction of the top, I was wishing that I could remember where I had bought it from. I only know that it was bought in the UK?! I think this has been the finest fabric I have sewn a garment with up to now. I adjusted my machine as per the recommendations from my machine instruction book and I even changed my needle, which I must remember to change back! The machine swallowed it a couple of times so perhaps I need to use some tape on the fabric next time. The top came together easily. I’m not sure why but I tend to do my hem and then the facings rather than the other way around. Does it matter? I don’t really think it does, I just wondered whether there was a reason most patterns do it that way in the instructions! I did have the extra long neck facing again though! Even though I remeasured the pattern piece to check that I had copied it correctly…so I’m really not sure why that was super long again. I just overlapped the facing like I did with the last top as I could not be bothered the undo the stitching and try to get it accurate for the size of the neck. I don’t think you can notice it from the outside and no-one will be looking at the inside of the my top anyway! The only thing that I had to ‘hack’ as such was the back. Whenever I leant forwards, the two back pieces would come around and dangle in front of my chest, revealing far too much! For this reason, I popped a couple of stitches on the back to keep the two pieces together more. I am super super pleased with this top and have worn it loads already!! I already know that I will be making more of these! Very cute and looks great on you! It never occurred to me that an overlapping back might come apart like that with a slippery fabric–yikes! It might be a cute detail to put a short row of buttons on the top of the back; I’m guessing this blouse goes over your head without a closure, so the buttons wouldn’t need to be functional. I can’t see a pressing reason to do the facings before the hem, unless it’s the general principle that it’s a good idea to finish everything that might affect how a garment hangs before you decide where the hem should be. 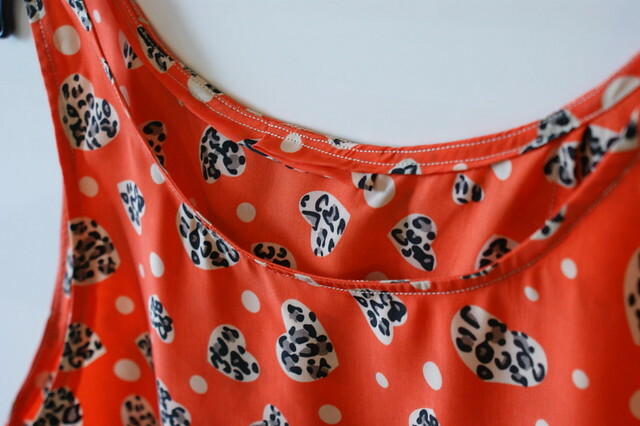 Looks even better on than it does on the hanger – such lovely, bright fabric! I must admit to the hems being the last thing I ever do on a garment, but that’s because it makes alterations easier. I love your fabric! 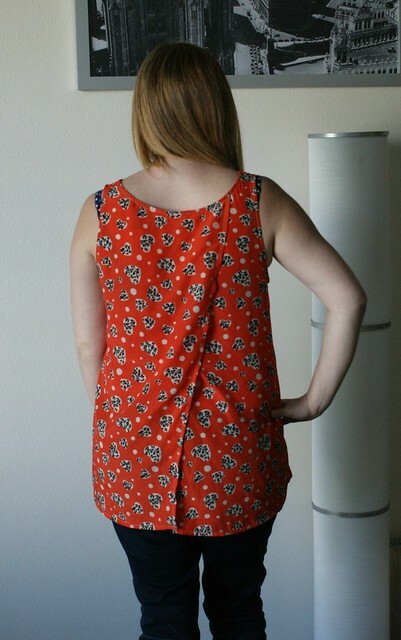 I can’t imagine making this top without putting a few safety stitches in the back – good idea! Yes I have, worn it loads already!!! 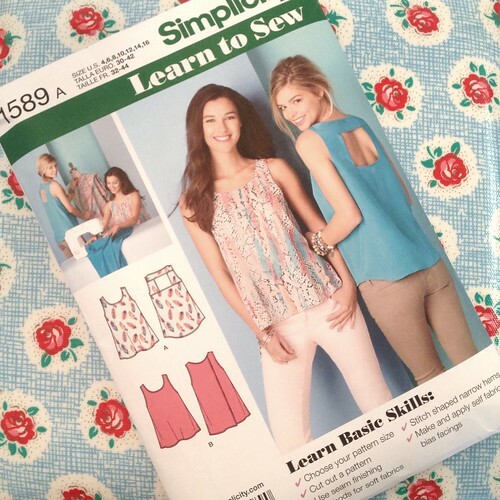 I love the simplicity of that top, great to sew up basics, they are so useful. I love your fabric. I must try and experiment with Simplicity patterns, they seem to offer lots of variety. 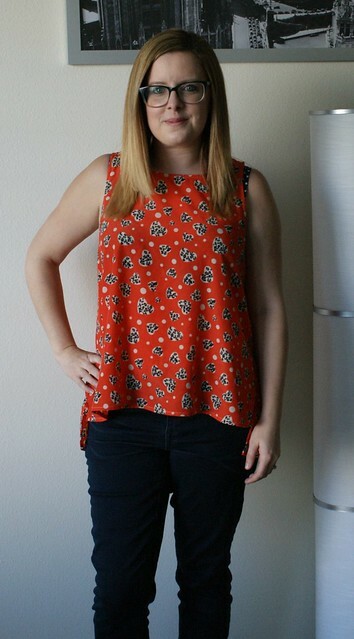 I’ve worn both of the tops from this pattern a lot! They are just comfy & seem to go well with jeans, shorts & skirts. I will certainly be making a few more!